As I wrote in the title of this post, the Romans do it again… and again… and again. Roman cuisine is one of our favorites and Rome is one of our favorite cities to visit and eat in. This dish, gnocchi alla romana, is a dish that reminds me how versatile, creative and (I’ve said it before and I’ll say it again) simple Roman cooking can be. Traditional methods of making gnocchi are some of the oldest ways to prepare food – the first noted recipe dates back to the 13th century. The original gnocchi were made with flour and water and had more of a consistency to pasta. It is possible that gnocchi actually pre-date pasta. These days, any “gnocchi” made with flour and water are called pasta, while gnocchi will be a dumpling made with anything else. The most well-known and traditional ingredient is the potato. Have you ever wondered why some people specify their gnocchi as “potato gnocchi“? Well, that’s the reason. Gnocchi does not exclusively mean using potato. Also, the shape of gnocchi also changes in Italy from region to region. 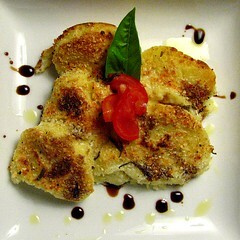 Which brings me to my dish – Roman Gnocchi. The Romans put their own spin on gnocchi by using semolina in lieu of potato, by cutting them into larger ‘discs’ and baking the dish. 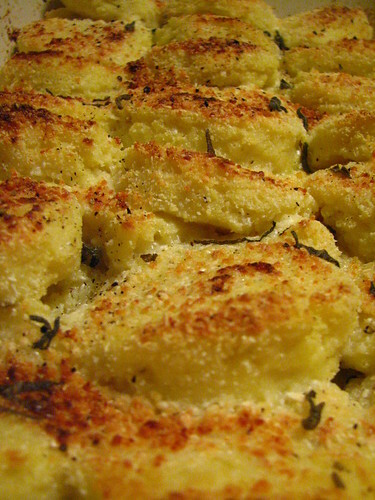 Originally this type of gnocchi was made using crustless bread. Those delicious Romans also add plenty of eggs, cheese and butter to the dish to make it seem like it would taste pretty heavy but, believe me, it tastes weirdly light at the same time. Ok, ok, so traditionally there should be about a half of pound of butter and cheese as the topping. Seriously, guys, it tastes weirdly light! Much lighter than a bowl of traditional potato gnocchi. Give this easy and different type of gnocchi a try. I’m sure it would be a conversation starter if you made it for friends. You could make different toppings (pesto, meat sauce, etc.) and pair it with roasted vegetables or an arugula salad to make it more of a balanced meal. Whatever you do, give it a try – but maybe wait till the summer is over in order to blast up that oven. Rub butter in a baking tin to grease. Beat together butter, parmigiano and egg/egg yolks and season with nutmeg and salt and set aside. Heat milk in a large saucepan. When milk is boiling, turn heat down and pour in semolina while stirring. Make sure you pour in a slow and steady stream. Increase heat again to medium. Cook until milk has been absorbed and mixture pulls away from the sides of the pan in one mass (about 6 to 10 minutes). Remove semolina from heat and beat in the butter/parmigiano/egg mixture. When smooth, spoon mixture into baking tin – spread evenly in the pan. Use a knife or a spatula if necessary. The semolina should be about 2 inches thick. Set aside to cool for 1/2 hour. Preheat oven to 375 degrees. Grease another baking dish. Remove cooled semolina from other dish (it should slip out if properly greased) and place on counter/board. Using a cookie cutter or 3 inch-diameter juice glass (or whatever else that is about 3 inches wide and circular) cut semolina slices. Arrange these slices slightly overlapping in your newly greased baking pan. Make the topping by blending the butter and cream and pour over the unbaked gnocchi. Sprinkle parmigiano on top. Bake in oven for 25-30 minutes or until golden. Feel free to put under the broiler for 3 minutes to make top extra-crispy. This looks marvelous! My family is from the Rome area and I grew up eating this dish. It’s one of my absolute faves! My mother makes gnocchi with ricotta too. Different, but still delicious! Wow. These look really delicious. I’m a huge fan of gnocchi. My infamous cabinet overstock includes a bag of semolina. You have given me a good way to use it. You guys just inspire me all over the place sometimes! YUM. I’m a huge gnocchi fan. And these have me drooling! I’m so very happy when it gets to be autumn, and people start making comfort foods again… YAY! Really beautiful dish you have going on. Great post. I want to be Roman right now! It looks delicious…wow. Look delicious. I have made this in ages and ages. it is now on the list. I would never have thought to use semolina – what a nice idea! I usually stick with a starchy root vegetable. This is a must-try. I will run longer for the butter. I never knew you could bake gnocchi. (I guess you can bake whatever you like!). I am now not afraid to make gnocchi. The thought of glue like potato dumplings never appealed to me. This method is simple and beautiful. What time can we come over for dinner? Wow. This makes me want to visit Rome. hey guys! thanks for all the comments. i wish i could invite you all over for dinner! and joan, interesting that the gnocchi looked like these in bologna! i’ll have to see if this dish is regional to that area, but also i wonder if she just cut her version that way. i’m learning more and more about ‘gnocchi’ and there are so, SO many different types. it’s exciting to attempt to try all of them. Given the wonderful things Romans do with artichokes, it’s no surprise that they create amazing gnocchi, too. This looks a fantastic dish and have to try this soon. I think we still have a bag of semolina in the pantry so I know where that’s going. Delicious! Terrific! I love the textures. And spending the extra 3 minutes under the broiler is time well-spent I imagine! Amy – Rome is wonderful for all the reasons you stated. I love this recipe and may make this again soon. Thanks for the thorough overview on how to make this – a well done job here. 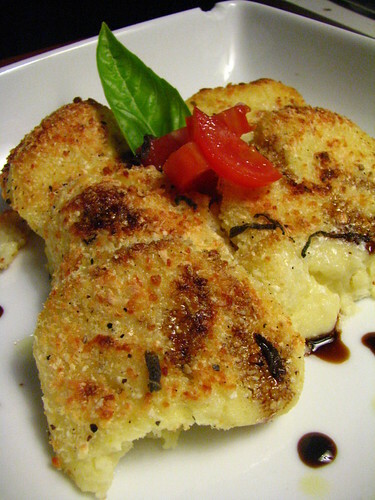 I love gnocchi so this is a great version of it- bookmarked to try! I’ve never seen gnocchi like this before – but I LOVE the look of it! Great pictures and blog too! Guys, these look stunning! Vegetarian husband made fresh gnocchi recently, but I think something along the lines of this would have been far tastier (hope he doesn’t see this comment)…Will get him to try this next time. Yum. I’m thinking this Thursday, I need eat some gnocchi. could we brown the butter first in the sauce? god, i love you guys! Surely a gluten free version could be made with rice semolina? Anyone other ideas? @Zemira: give it a try with rice semolina and let us know how it goes. You could probably also use finely ground cornmeal too – masa harina can be found at most Latin American markets in the US, and some larger grocery stores. Alternatively, you could run polenta through your food processor until it’s finer.